"The only creature indigenous to water on Stroggos. 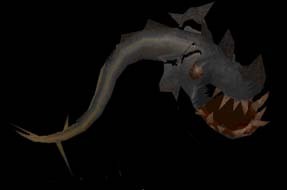 Their blade-like teeth and spiked tail are capable of disemboweling you." Personally, I can't recall ever being hit with a shark's tail; they obviously prefer to use their teeth. These guys would be more of a nuisance than a threat, except for the fact that they are very manouverable and nearly impossible to hit. A weapon with good spread like the shotgun or supershotgun is essential for taking on these guys, and you'd be best to jump out of the water if you're facing a pack of more than two, unless you're SURE you can see them all.